This little fellow was wriggling around on the rock path. The liquid secretion, and it’s jerky reaction when touched, leads me to think it was preparing to spin it’s chrysalis. The kids and I put it up on an Echinacea leaf in hopes to witness the process. Of course, it has disappeared. But our curiosity remains …. what IS that caterpillar? Using our observational skills we can see; no hair, it’s about 2 inches long, green underside and purplish top, single black horn, and black spots along the ribs. I can’t tell which is the back or front, but the end opposite the horn has a faint gold band. My guess would be the end opposite the horn is the head. 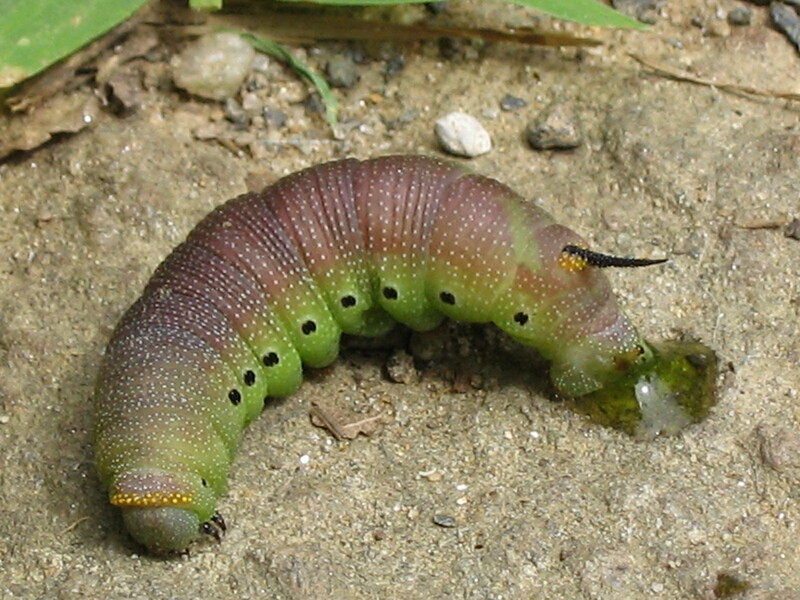 The whole upper body shows little white pore-like raised spots. 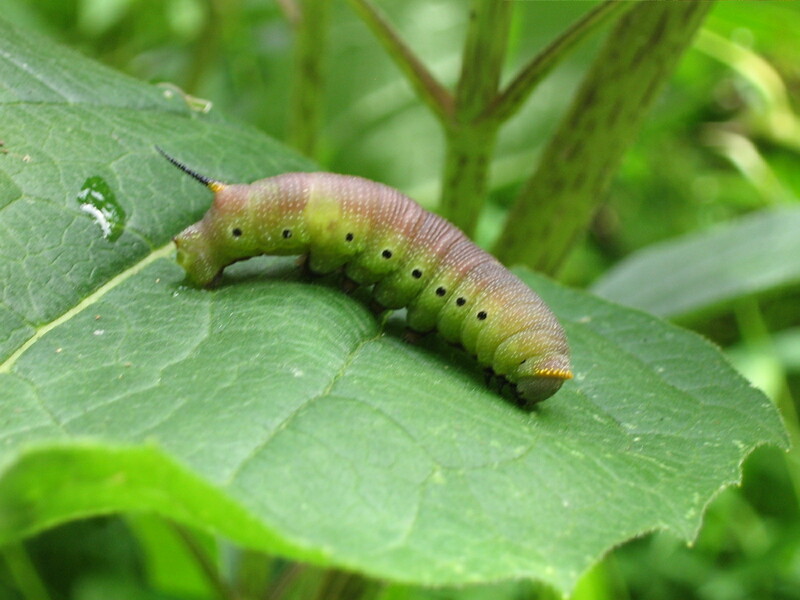 So we sent in an inquiry to the Bug Guy at What’s That Bug ….. which you can do too if you find a mystery caterpillar. Be sure to check out the ones already on there … I have never seen such wormy wonders! I’ll let you know what it turns out to be…. maybe you already know! A simple hike at Great Hollow is never boring. Like a few weeks ago when Andy and I saw a wild mink on the trail. Yesterday we took some friends on a short welcome tour through the Hollow, in the bright sunshine and the lush landscape of August. The river was lower than usual, but crystal clear, showing off the water-polished stones and the wriggly little fish on their way to somewhere important. The landscape smells so peculiar now, with odd notes of sharp citronella-lime from the Walnut trees, and various loamy wood aromas from fallen trees and animal homes. By the bridge we spotted this beauty – our Native Lobelia cardinalis, or Cardinal flower. 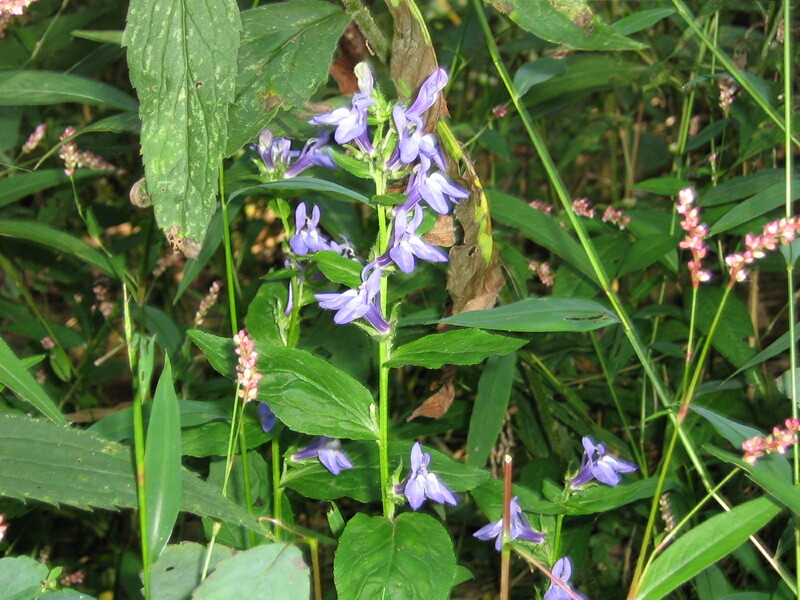 A sister to the blue flowering Lobelia inflata, both species have been used by Native American as a remedy for lung ailments, usually as a tea or chewed fresh. The latter inflata species is also called ‘pukeweed’, as a reminder not to eat the seeds unless you need a fast emetic. One leaf however, can be chewed for it’s pungent taste to alleviate a headache or congestion in the throat. A carrier of alkaloids, you’d want to stop there. Dinner can be harvested around the corner in the giant Nettles patch!